The group ensures that its efforts aren’t temporary. This year, the group will disassemble the park and rebuild it in the Reagan Park neighborhood at 23rd and Guilford Avenue. The park will also feature shading material from the RCA Dome in a collaboration with People for Urban Progress. 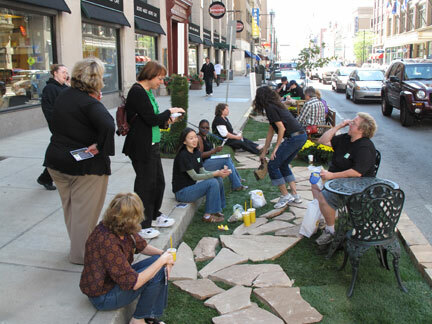 I plan on attending the PARKing Day event at Borders next Friday. I’m excited to see what they create this year. You’re welcome! Thanks for visiting Urban Indy. This is absolutely one of my favorite events for cities. These architects are reminding us that our current street designs are depressing, but there are simple ways to make them better! Carmel took back some of their streets. Not quite in the same fashion as (PARK)ing day will, but at least someone in the region is looking at how to take the streets back and give them to pedestrians.